Table 1 shows geometric parameters of a sheet with voxels. 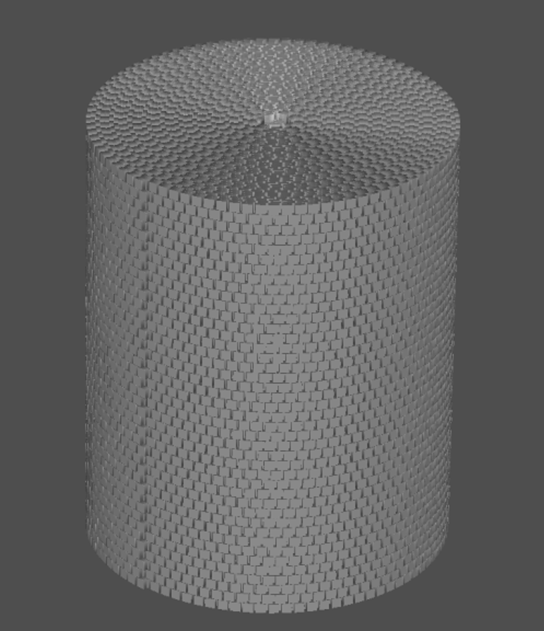 Let’s analyze a cylinder that constitutes a finite computational mesh with voxels. Without loss of generality we consider that the height of the cylinder coincides (or agrees with) with the sheet width, and cylinder radius is . 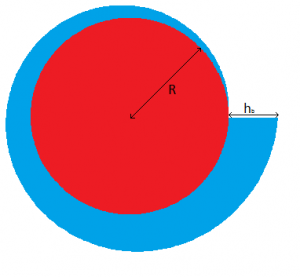 Section, orthogonal to the axis of cylinder, is shown in picture 2 (red color figure). Henceforth, if not to say the opposite, cylinder is a figure with the section as shown in pic. 2. To develop the algorithm of transferring the surface of the object into voxels it is necessary to perform the transformation of 2D coordinates of a point on the sheet into 3D coordinates, which will appertain to the point after wrapping the sheet around the cylinder. Let us develop formulas of transformation of 2D coordinates into 3D. Let the point on the sheet is set by , coordinates, and it is necessary to compute corresponding 3D coordinates . Assuming that the axis of cylinder coincides with , axis and the lower base of cylinder is situated on the surface. According to some specifications made, the equality (congruence) = takes place. 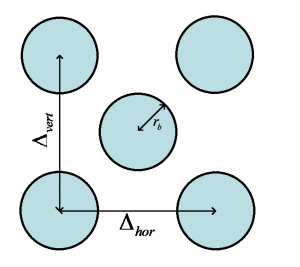 Equation (4) is solved by numerical methods, for example, by Newton method. As can be seen from the above, we have described a mathematical model of the development of configurationally complex computational mesh, consisted of voxels that are situated on a sheet and twisted into cylinder. This entry was posted in Computatilonal Geometry and tagged Archimedian spiral, bubble shaped computational mesh, complex computational mesh, computation of a bubble sheet, deformation of bubbles, equations for creating the computational mesh, mathematical model of computational mesh, sheet deformation, simulation of a bubble sheet, simulation of physical processes, solution by Newton method. Bookmark the permalink.